Amarettini—or mini amaretti cookies—are the Italian version of macarons. Amarettini—or mini amaretti cookies—are the Italian version of macarons, generally flavored with almond paste or amaretto liqueur. They’re small (think tea cookies), not too sweet, and are the perfect treat for when you just need a little something saccharine in your life. The last time I had a sweet craving, I ate two of these bad boys, and felt totally satisfied without hating myself for ingesting a week’s worth of sugar. 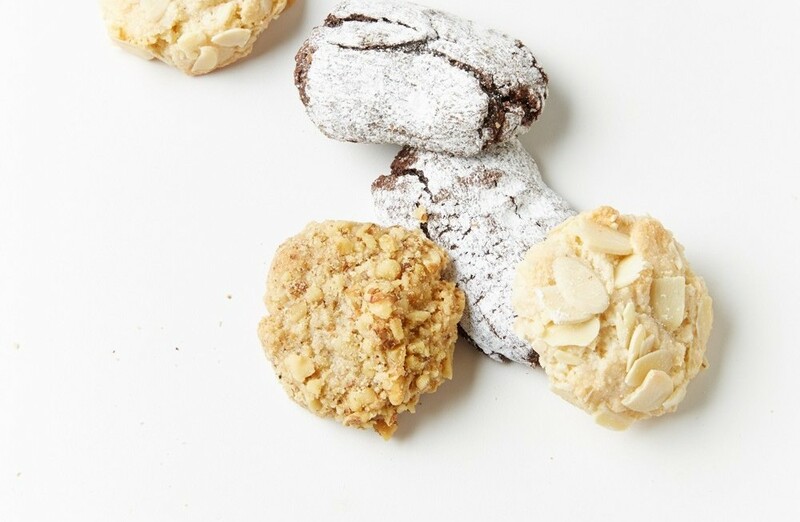 The sugar-dusted chocolate amarettini cookie tastes almost like a light brownie; its crunchy outer shell and soft inside is complemented by just a hint of sweet, earthy almond flavor. The almond cookie is firm but chewy and not too sweet, with the flaky nut slivers on top adding a nice textural contrast. The walnut version also has the perfect amount of sweetness, and, because it’s filled with nuts, I can pretend that it’s somewhat healthy. Right? Whatever. Bottom line: These mini cookies are the perfect sweet treat to keep around the house for when you need a little sugar. Just try not to eat them all at once.